Pampers Gifts to Grow: 310 possible points for new members! You are here: Home / rewards programs / Pampers Gifts to Grow / Pampers Gifts to Grow: 310 possible points for new members! If you’re not familiar with Pampers Gifts to Grow, you can enter codes from Pampers diapers, wipes, and training pants and accumulate points that can be redeemed for rewards. I typically save mine until they have gift card offers, but you can also get Shutterfly items, toys, Diapers.com codes and more! Right now, for 1,000 points, you can get a $10 Diapers.com gift certificate, a 20 page Shutterfly photo book, or a $10 BJ’s gift card! Here’s how you can potentially score 300 more points right away! 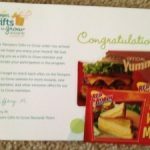 Pampers Gifts to Grow: New code + 305 possible points for new members! Pampers Gifts to Grow: New code + 310 possible points for new members! Pampers Gifts to Grow: 330 possible bonus points for new members! Pampers Gifts to Grow: 320 possible bonus points for new members! Pampers Gifts to Grow: 10 points for current members and possible 320 points for NEW members!